I’ve owed thriller novelist Gerry Doyle a guest spot for a long time. His debut book, From the Depths, came out early last November–just a month after my own debut. Debut writers always go to the head of the line at the Handbasket. Newbies need all the exposure and support they can get! Gerry’s an editor for the Chicago Tribune’s Metro section, but From the Depths takes place far from the Midwest. He brings new energy to the techno-thriller with CIA forensic scientist Dr. Christine Meyers, who must work with the Navy SEALS to discover what killed the entire crew of a defecting North Korean sub. This past summer at Thrillerfest, From the Depths was one of the five finalists for the International Thriller Writer’s Best Debut Novel award. Today he’s in the Handbasket to answer a few questions. You can meet him at his own blog, Read Ink, too. As a career journalist, what was the instigating factor in your jump into fiction? And thriller fiction at that? The instigating factor for my jump into fiction is the same as that for my jump into journalism: I just love writing. I’ve been writing fiction since the time I could pick up a crayon, and my love of the written word was what ultimately nudged me into journalism. Writing a book was almost an accident: An idea that just started gathering momentum as I put it on the page. All of a sudden it was a novel! The thriller genre is one that I think just about all of my work fits into. I tend to launch writing projects from ideas: What if? Why? How? And in the course of answering them, tense and precarious situations tend to unfold. Who first encouraged you to write? Whom do you most resemble in your novel? This is a tough one. I don’t think I’m anything like the protagonist–even leaving gender aside–and many of the SEALs aren’t exactly good guys. But if I had to pick one, it’d be Campbell. Like me, he’s curious about the world around him and sympathetic to goals that sometimes cut against conventional wisdom. He also looks good in black. How many times have you been asked if you might be featured on Oprah? Ha! More times than I can count. For a long time, the easy answer to that question was, “I don’t think that submarines full of dead people really fit Oprah’s theme for her book club.” But then she recommended “The Road”–which is a fantastic read–and although it doesn’t have the submarine, it’s definitely littered with corpses. So maybe I have a chance now! I just finished polishing up a manuscript, actually. Another thriller, but this time in a more common setting: The streets of Chicago. A disgruntled journalist is forced into covering a throwaway story that ends up dragging him into a deadly conspiracy. In short. This is a risky question. Your fellow debut novelist/journalist Julie Kramer had no answer for it and I’m worried I might have to take it out of the rotation. So–Patrick, Spongebob, or Squidward? Patrick. Happy-go-lucky, friendly and supportive. And if you cut off one of his arms, it’ll grow back. Tomorrow in the Handbasket: Debut thriller novelist and Backspace founder Karen Dionne! From the Depths was a great read, and particularly impressive for a debut! Can’t wait to see what Doyle can do with the urban underbelly of the Windy City. Way to go, Gerry! Can’t wait for the next book! Thanks for the interview, Gerry. It’s inspiring to hear how you could move from journalism to fiction (and back?) 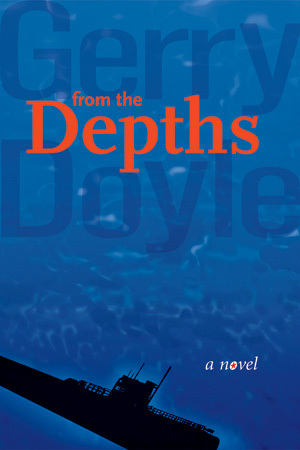 I’m looking forward to reading From the Depths – always looking for a good thriller to share with my family. Sounds right up my alley.